from 3 pcs. 16,07 EUR ea. from 10 pcs. 14,44 EUR ea. from 20 pcs. 13,67 EUR ea. from 40 pcs. 12,99 EUR ea. 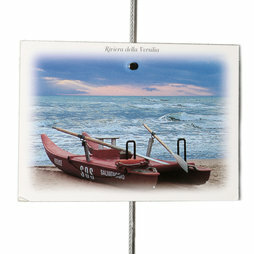 This photo rope with a 2 mm thick steel rope is 2 m long and offers even more room for photos and postcards. If you don't have a tall enough room, you can always "redirect" the rope with additional nails along the wall instead of hanging it up vertically. Included in the delivery are 20 small neodymium magnets and a 2 m long steel rope with a loop and weight. The photo rope in full length.